Damn, Guinness is so smooth. When I first arrived in Dublin, this was one of the places I definitely wanted to visit. Looking at TripAdvisor, there were a lot of “tours” and “skip the line” passes at various prices. Anytime I see various pricing, that means I can find the lowest price. TripAdvisor doesn’t mention that you can buy tickets to the Guinness tour online and you can skip the line! All other places selling tickets have a markup! It’s a self-guided tour. The prices range between E19.50 and E23. It depends on the time slot you book. After booking online, you’re good to go. Just show up to the Guinness Storehouse, show them that you bought your ticket online, then head in to the right. There will be a kiosk for you to input your confirmation number and it will print out your official Guinness Storehouse entry ticket and a voucher for a pint. If you’re +/- 30 minutes, it doesn’t seem to be a problem. You can take that ticket, hand it to the person at the entrance and walk right in. It’s a self-guided tour, but the routes are all one-way. The tours progress as you take the escalators up to the next floor. There is no escalator down. There is an elevator, but that’s available at the top to take you all the way to the ground floor. 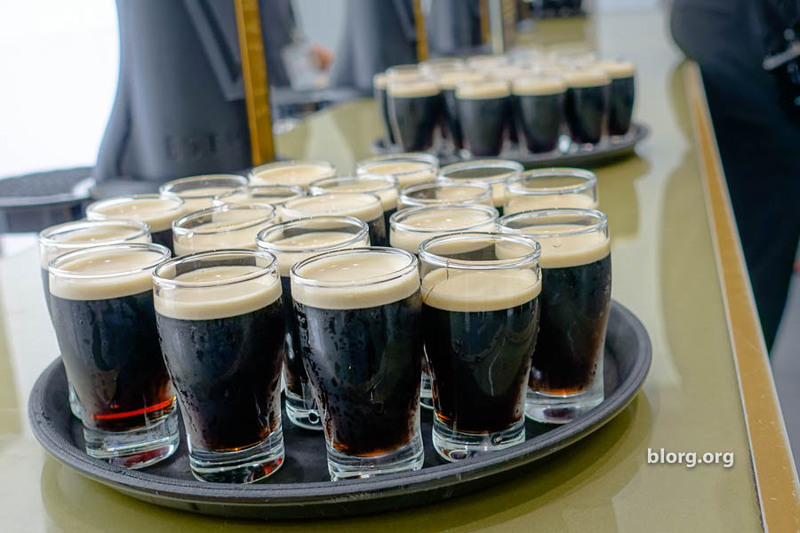 If you have the endurance, you can get very tiny amounts of Guinness in the Tasting Room every 30 minutes. The tasting room teaches you about how Guinness is created and that it’s really a dark ruby red color. It was a 15-minute class after a 30-minute wait. I would avoid this if time is more valuable to you. On the 5th floor, there are 3 restaurants on the same level. I made the mistake of eating at the first restaurant: Brewers’ Dining Hall. I had the class “roast beef and mashed potatoes” with a Guinness. The Guinness was delicious. I finished the beer but not the food. The roast beef was super dry and lacked flavor. It made me sad. I feel sad remembering how bad this tasted. The taste was so bad that you feel bad for the Irish people and the suffering they have endured by having to eat food with poor flavor. Then I drank the Guinness and was happy again. If you completely walk around the 5th floor you’ll see the other 2 available restaurants at similar prices. These restaurants looked like they served more modern gastropub-style food. At the very top floor is a crowded bar where you can see all of Dublin. I redeemed my voucher for a pint here. The beer was super smooth but the facility was very crowded. The facility is very nice and modern and it’s definitely a “one-time” visit type of place. Guinness isn’t actually brewed at this facility so it’s really just a museum with a bar. You can absolutely skip this if you’re on a tight schedule while in Dublin. If you do go, avoid eating here. Pingback: Take On Godzilla Yourself In Virtual Reality At New Attractions In Osaka And Tokyo | StudHouse - интернет-агенство помощи студентам!